Mangaluru, Jan 9, 2017: Reports state that the pavilion of the DK, Dakshina Kannada has been selected for first prize at Mysuru Dasara Exhibition – 2016 organised by Karnataka State Exhibition Authority in cultural capital of Karnataka, Mysuru. Almost all districts of the state have installed stalls reflecting their respective local culture, life style and others in the exhibition. There was a stiff competition among the districts participated in the event for the first place. The stall representing Dakshina Kannada has included various feature of rich Tulu culture including folklore, Yakshagana, Tiger Dance, Daivaradhane, fishing, fish vending, coastal culture, and others. The stall is succeeded to narrate the history of coastal city Mangaluru also. There is statue of brave Ullal queen Abbakka in front the stall. 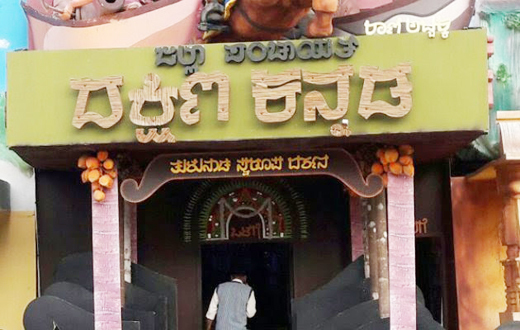 The entrance of the stall is modeled on houses in Tulu Nadu house during festivals, marriages and other special occasions. the appreciation of the display was high and a number of people flocked to see the rarities. Dashing Kannada is known for its tradition, it is great that people have appreciated it and is liked by many so it has bagged the first place.